A little background on Dennis Farrell, he’s a former ESPN Radio, NBC Sports Radio Detroit host. Currently he’s a host of fantasy sports shows on http://www.foxsportsdetroit.com and NBC Sports Radio St. Louis 1280 AM. 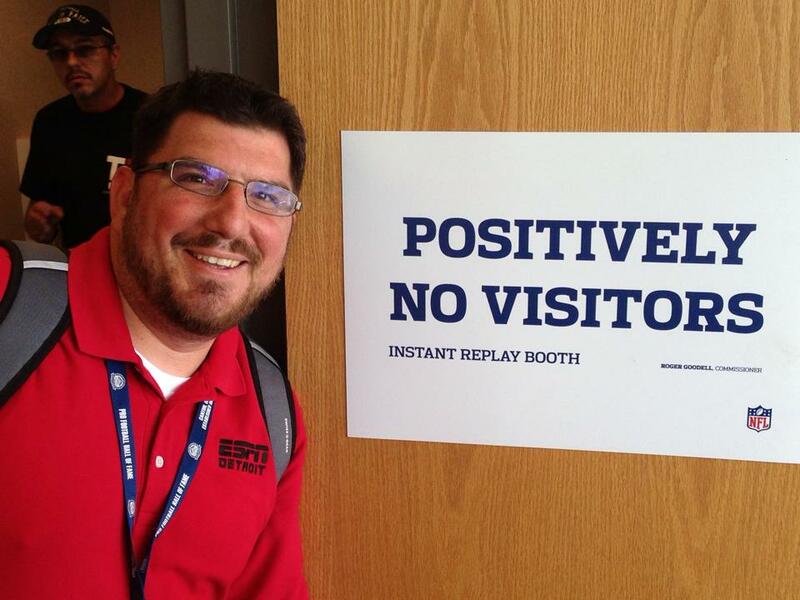 His fantasy sports show also airs on Armed Forces Radio where he is the program director. Fantasy baseball is his first love and passion but he has also been quite successful in fantasy football. Dennis’s fantasy baseball podcast was on the top 10 on iTunes for over a year and a half. If you want to get in touch with Dennis you can follow him on Twitter @Dennis77Farrell or you can email him at dennis77farrell@gmail.com. Join Dennis Farrell of The F Word, Fantasy Sports Network, and Fox Sports Detroit with special guest Nathan Tucker. We’re getting into some early player rankings and setting the landscape for a successful 2015 fantasy baseball season. You can followJoin Dennis Farrell of The F Word, Fantasy Sports Network, and Fox Sports Detroit with special guest Nathan Tucker. We’re getting into some early player rankings and setting the landscape for a successful 2015 fantasy baseball season You can find Nathan Tucker on Twitter @fssnathan Dennis Farrell on Twitter @Dennis77Farrrell or check out his website, dennisfarrellradio.com. go to DennisFarrellRadio.com for show times. What have I learned so far in this 2014 fantasy football season..
1. Nick Foles -Man heres a guy I was so high on and thus far this season he has been fools gold. One of the worst 1st half QB in fantasy football and has posted only 1 20+ pts game out of the last 4 weeks and the DUD in week 4 with only 3..no really 3! fantasy pts. and next week vs STL who has one of the best front 4 in the league.For some reason his trade value is still sky high and with tough matchups in week 5 vs STL , 8vs AZ I think its time to see what the open market might bring for him. 2.Leveon Bell -Once he started to drop to round 3 in most leagues,I tweeted (@Dennis77Farrell) jump on him in the 2nd round..Now he looks like he could end the year as a top 3 RB this season and also has 19 Rec on the season.The price might be to high to trade for him but I would not think twice in trading McCoy or Charles for him if you can find a sucker. 3. CJ Spiller- Here is a RB with no touchdowns and no respect among but he is a great buy low player, healthy and getting 10+touches a game and could easily heat up and net you 15-17 touches a game. 4. Matt Asiata- Sell high now!!! he value will never be any higher then it is now (Week 4-20/78/3) Sure he will have a good game vs GB in week 5 but after that he plays Det who has the 6th best Def vs RB Buf who has the 7th best Def vs RB and in week 9 Washington who as of right now the 2nd best D vs RB. Now you wont get a stud in return but dont worry use him as a peace to push a trade for a stud. 5.Eddie Lacy- Buy now, the whole Packers Offense has looked sluggish but in week 4 the passing game came alive so its only a matter of time before Lacy hit his stride and becomes a fantasy stud. 6. Jeremy Hill- If you act now you can catch someone in your league sleeping and steal Hill from them. Being drafted as a backup he has worked his way into your Flex spot with 19 pts in the last two games his roll in the Offense will only keep growing. Unlike Asiata Hill is the real deal. If your on Stitcher– http://www.stitcher.com/podcast/dennis-farrell/the-f-word please do the same head over fav add it to your list and rate it 5 stars. Only to wake up the next day to see Yahoo Fantasy Sports has graded you a C- and worst draft in the league? Now I get that it does not mean much and we still are a few weeks away from the start of the season and really what does yahoo know? I had the worst draft grade in the league last season and won the whole thing so why this year does it run me the wrong way? I’m really not sure but when I woke up the day after my draft to see that I crushed the draft and yahoo and my league mates would be forced to recognize my greatness on draft day. Sadly yahoo stole that from me. So you ask what does your team look like? Before I tell you , just know in this league I’m only forced to play 1 QB 2-WR 1TE and 1RB with 2 flex spots. I opened up the draft picking from the 10th spot out of 12 team , having 4 picks between my next pick on the swing around. With my 1st pick 10 overall I go Dez Bryant while I was one pick off of his ADP (11) I opted to go Dez over AJ Green here the chance was slim to land both I had a plan B who I was just as happy to land with my next pick. Pick 2 15th overall I went back to back Wide outs and snagged Julio Jones . Jones has a ADP of 16 overall go picking at 15 was not far fetched but I have high hopes that Julio can end the year as a top 5 WR. My 1st big steal of the draft came in the 3rd round and with the 34th overall pick I selected Le’Veon Bell, I’m not worried about his run in with the lawDog at all this season so while he still sports a ADP of 22 I was more then pleased to land him 12 spots later then his ADP suggests . So far I now have two Wide outs and one RB so with my 4th pick I really was thinking Rb here and I had a feeling Doug Martin might fall to me here but he was picked with the 38th overall selection in turn making me rethink my pick. At this point I Figured I would bolster the best WR core in my fantasy league so when I seen Keenan Allen sitting around I jumped at the chance to add him with my 39th pick .Right now Allen is being drafted around 33 overall. With some of my early round steals like Bell and Allan I let the draft dictate my next move here with my 5th round pick and already 6 QB off the board I felt the pressure here and reached for the guy I wanted knowing with the way the draft was going I might be on the wrong end of a QB run and QB Touchdowns are worth 6 points here I went Nick Foles with my 58th overall pick in this draft . Foles has a ADP of 73 right now so reaching at 58 hurt a bit . I would have loved to wait until my 63rd pick and I know it’s only 4 spots but two of the next 4 picks after mine was the QB position . And now my two Flex spots (Maclin,Allen) all that was really left was my TE slot and Def and K.
As round 7 started I had my eye on Jason Witten here hoping to secure a what I think is to be a top 4 TE. Unfortunately Witten was selected 2 spot ahead of my draft position so now opting to wait on a TE and watching to see if a run was on it way I wanted to add depth to my Running Back core and with only one RB on my team after 6 rounds I went Chris Jonson in round 7 with my 82overall pick , if your counting at home that a true steal at 23 spots latter then his ADP suggests (59) . How do I celebrate that? Why going for what I feel was my 2nd reach of the draft and picking Zach Ertz (89) with a ADP of 106. I could have waited on Ertz I think at the time he was rated at the 4th best TE still on the board but if this Eagles team is as high octane as everyone thinks why not try for another combo of double points. Alright we move onto the 9th round if your still here, with only two RB on my roster I went with Bernard Pierce while I’m shocked at how late Ray Rice has been going in drafts I was just as shocked to see Pierce sitting around until 106 most drafts he has been going around 80-87 overall spots . Josh Gordon ADP of 105 is a true risk reward player while he finished last season as the 2nd best WR in fantasy football with two less games played and facing between 6 to a whole season suspension this year I took a chance on him at 111 10th round . If he plays this year you could get a stud to plug into your lineup late in the year for a playoff run . With most of my starting lineup set and the start of the 11th round I wanted to start working on a bench of players with a ton of upside so I went with Jonathan Grimes,who you ask? Last month Houston made two moves dropping André Brown and Dennis Johnson making Grimes and rookie Alfred Blue and if you have ever employed Foster on your team you know he may or may not be looking replace him in your lineup from week to week. Round 12 I got to thinking what if I’m wrong on Zach Ertz ? Maybe I should draft another TE who would replace him in my lineup. Hey why not backup a Ertz with a even riskier player so in steps Eric Ebron and in my defense Ebron has been drawing comparisons to Jimmy Graham so why not? Ebron has a ADP of 146 and I drafted him 135 overall. I take Jeremy Hill at 159/14th round and that’s a steal because he has a ADP of 116 then Ahmad Bradshaw at 178 his ADP is 138 and with Trent Richardson looking like a hot dumpster fire I think Bradshaw can give you 9th or 10th round production . I go kicker Rob Bironas and end the draft with 202 overall and almost 50 later then his ADP call for is Jonathan Stewart who already has a 2TD game is pre season. So in a nutshell that’s my team. Just alone my starting lineup would be…. Follow me in twitter @Dennis77Farrell please please hookup a friend and retweet this. If you find the time can you hit up FoxSportsDetroit.com and check out my fantasy football videos . Also new go to 97.1 FM news talk St.Louis and the DGS blog for more fantasy football advice. So it’s draft season and this past weekend I held my first draft of this 2014 season in what happens to be my favorite fantasy football league. I have dubbed this league the “Celebrity” league.. The Bear Down Podcast league was birthed from a talk myself and Matt Walsh had after one recording for my show where I pitched letting me host a podcast league for his show. Last season we had some great talent like Rob Riggle,Dave Glover and Marc Bulger. Here is a list of this year names and a draft recap for the 2014 BDP league. – Brad Morris (@bradmorris773) Stand up comedian and by far was the hardest guy to get logged into the league. – Max Foizey (@MaxonMovies) airs on (@971FMTalk) out of STL and producer for Dave Glover Show. Team Csonka in the draft will be played by him. -Dan Van Kirk (@danielvankirk) Ryan Sickler told me Dan had the best Mark Wahlberg impression.Also you can find dan Co-host Sklarbro County on Earwolf – Perform on UCB Maude Team: TUT! – Write the NFL blog Upon Further Review – Watch his sketch show DVK on Nerdist Channel. – Travis Hafner MLB player Cleveland / NYY He once drafted himself in fantasy baseball. Scot has had his hand in the making of some of your favorite movies like Old School,Semi-Pro,The Hangover 2 and others. I really had my eye on Jones or Jeffery here. but he got his guy here. Reach of the round: Me with Stafford, I had my eye on Cobb here and after he went 29th overall I was left for the 1st time in the draft without a clear cut draft pick. Ellington would have been the smart play but after going Calvin 4th overall I figured why not let go double points. Staffords ADP is 44th. Steal of the round: Has to be Gronkowski with a ADP of 30 a that’s a 11 spot fall. So I went Gerhart and with a ADP of 37 it suggests I got a deal here but I think real life play he might be more in the 50-60ADP range. I needed a RB and I just could not draft Sankey here. Reach for the round: Trent Richardson It had to be someone I guess. I was going to go CJ2K here but he was sniped right before me, I’m I happy with Patterson sure with a ADP of 46 I was kinda shocked he fell. Steal of the round: I kinda feel like snagging Maclin at the end of round 5 in a 14 team league is great value. Reach of the round: Hands down Terrance Williams with a ADP of 85 no doubt he would have been still on the board in round 6.Also RG3 or Ridley here both guys might have been sitting around on the round 6 swing. Steal of the round: SHHHHHHHHane Vereen what a true steal here with a ADP of 53 congrats! that was a steal. Once Pitta went I just had the feeling I waited a round or two too long. Steal of the round: I really like Moreno the hate on him is so crazy and in round 8 it can only help you more then hurt you.Also Bowe here. Reach of the round: Tre Mason I liked a few guys in round 9 over Mason here. I kinda went rookie crazy in the end of the draft, I cant lie I wanted Ebron here went with the hopes Lefell gets his grove back. I love the Gates pick here. The F Word live Thursdays and Fridays at 1pm est on channel 147 Cable Vision in NYC,NJ,CT. Itunes The F Word and go check out Matt Walsh (@MrMattWalsh) new movie Into the Strom. Ad this fantasy football season limps into full affect I wanted to take a break from tv, podcast , mock drafts and ADP talk to take a look at some news and a few silly things I have seen and heard. Over the Pro Football Hall of Fame induction weekend I had a chance to talk fantasy football with a former Green Bay Packers RB who not only told me but pulled out his phone to show me that he took the Seahawks Def in the 1st round of his draft. Now as you could imagine I wanted to and tried to talk him out of it quite passionately , I’m sure it was hard to take me seriously as I was laughing hoping to see a candid camera host pop out some place. Yes I think it is silly to take a Def in the 8th round (Seahawks ADP right now) in 12 team leagues but after some poking around I might have just changed my mind a bit…Just a BIT!! Look last year the Hawks Def scored 195 fantasy points… That one more then both Dez Bryant and Adrian Peterson .Eddie Lacy and Brandon Marshall(198) only scored 3 more fantasy points then the Seattle def and both guys are going in the 1st round .Aj Green managed to out score the Def by 8 points while other guys like Demarco Murray(189) and Alshon Jeffery(186) finished behind the Seattle Seahawalks in points. Look I’m not saying go crazy here but maybe the 7th or 8th round is not so crazy for a player(Seahawks) that can give you top 30 overall points in and around picks 90-96 overall. St.Louis Rams have listed Kenny Britt as the teams starting WR on its depth charts. Here’s a guys fantasy owners every year over drafted him looking for that big season out of him, Off the field issues and injures has derailed any hope of that. With a ADP of 13.2 right now Britt has become a true sleeper WR this season with zero risk and what we hope is a ton of upside. Same will go for Josh Gordon who finished 2013 as the number one WR in fantasy points who is also facing a one-year suspension with a current ADP of round 12 in 12 team league and no word for 1-3 week on if it gets lifted or reduced. Here’s the deal I truly think the NFL will wait until last second to announce anything leaving fantasy owners in limbo. If my draft was today I would absolutely take the risk in round 12 on Gordon , by round 12 your filling in your flex if not bench guys your hoping to hit on and if he is out for the season WR is so deep take a guy like Nick,Hopkins and even rookie WR Mike Evans in round 10 . If Gordon does play I’m guessing he would still sit for 6-8 games and being that deep into the season and getting a guy like him for a playoff push would be like a free gift or a crazy late season trade that would put you over the hump. James Jones now with Oakland who in the last two years with Green Bay had 24TD is listed as the 2 team WR . Adrian Peterson will not see any action this pre season.. Don’t be shocked at this news Peterson has not had a per season snap since 2011. As always you can catch the Tv show and fantasy shorts on FantasySportsNetwork.com and Cable vision channel 147 in NYC Thursday and Fridays at 1pm est everywhere else check with you local cable provider . Also on Fox Sports Detroit and Pro Football Focus Fantasy (The Fantasy Slant). When I lived in St.Louis I had a favorite radio show The Dave Glover Show hashtag #DGS971 now this show helped get me though some bad times.. A job I hated a divorce . It was my my best friend mon-fri for a few hours a day. Now keep in mind going into the media business was not even on my radar, from show one I never missed it. Now I live in Michigan and podcast all 4 hours of the show and over the last 2 years they (Dave and Max) have let me become part of this one thing that has been part of my life . I take more pride in the 5 min hits I do for them then any of my other projects. So this fantasy football season I will be giving the DGS fans fantasy football advice via the DGS blog I’ll give you sit/starts and matchup advice while answering email questions!! Keep a eye out for more info here or go to the Dave Glover Show Blog or head over to ITunes and Download the show. Let’s play the Fantasy Football Over/Under game. And channel 147 on cable-Vision in NYC. With the player and your projection based off of the Over/Under of the number I present .Heres your chance to show everyone how fantasy football smart you are!! Remember check out The F Word on ITunes or Sticher. And Dennis Farrell on Facebook.